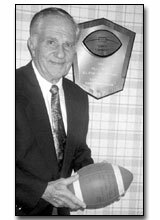 In Hal Lambert’s 22-year career as a Los Angeles area high school football coach, his teams won or tied for the League championship eight times. He was head coach for five high school all-star games, compiling a 4-1 record. In 1974, Lambert coached the North team to a 9-6 victory in the High School Shrine game played in the Rose Bowl. Following stints at Poly High and Reseda High, Lambert transferred to the brand new Taft High School in 1960 and became its first head coach--in baseball, tennis and football. Taft won its first League football championship in 1965, and repeated in 1966 and 1967. The school returned to the winner’s circle in 1972, and again in 1974, 1975 and 1976. A heart attack forced Lambert to retire in 1981. Lambert was twice elected President of the Los Angeles City Schools Coaches Association. In 1980, when the L.A. Unified Board of Education announced it was terminating “minor” sports, Lambert led the LACSCA through a unique and ultimately successful series of actions that prevented cancellation of such sports as gymnastics, soccer, and other minor sports.